It was an evening that everyone had been looking forward to. An Initiation ceremony is one of the most complex to perform and on the night members of St Paul’s Lodge No 5459 did so with both confidence and panache. Neil Worthingtion (right) congratulates Anthony Hamilton. The ceremony started by confirming the minutes of the last meeting. David Clews read the third Charges of a Freemason, which was appropriate for what was to follow. The next business was to initiate Anthony Hamilton. Anthony actually was balloted twice which is quite unusual. The first time was in November 2017, but due to Andrew sustaining an injury the first ballot period expired. 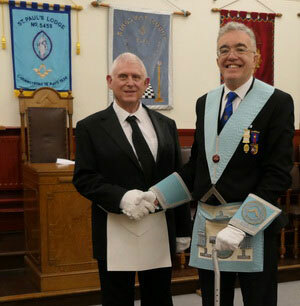 Andrew was re-balloted for a second time in open lodge in November 2018 and as before the result was unanimous. The WM Neil Worthington invited Les Williams (who is the secretary of the lodge) to assist him by occupying the master’s chair in order to initiate the candidate. Les willingly accepted and then the main part of the ceremony began. Anthony Hamilton had been prepared outside of the door of the lodge and was then admitted in due form by the junior deacon, Adam Berrington. Chris Farley, who is the inner guard, gave an explanation of the working tools of an entered apprentice to the initiate. The charge to the initiate, which is a very long piece, was delivered faultlessly and without any prompting by David Clews. David is the assistant director of ceremonies, which explains why the charge was delivered with such professionalism. The ceremony was conducted flawlessly throughout. The WM was afterwards restored to his rightful place and requested that his thanks to Les Williams and David Clews be recorded in the lodge minutes. The lodge retired to enjoy a festive board together. A toast was made to the new brother Anthony, who responded with a genuine ‘from the heart’ response. Everyone raised their glasses to him and wished him well in the start of his Masonic career. It was good to see several Masons from other lodges who came along to support and celebrate with the members of St Paul’s Lodge. All in all, it was a very special evening followed by a joyous festive board, and a new member to St Paul’s Lodge. Anthony Hamilton being supported by officers of the lodge and guests after his initiation.